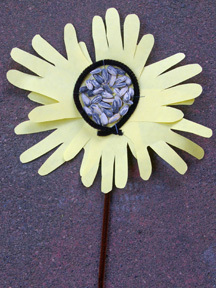 Capture the size of your preschooler’s little hands with this fun sunflower craft that’s quick to make at home or in school, with just a few basic supplies. It’s a great summer day camp activity, too. What You Need: Yellow construction paper; pencil; glue; sunflower seeds; black pipe cleaner; brown pipe cleaner; scissors; stapler. How to Make It: Trace child’s hand 8 to 10 times on yellow construction paper, using pencil. Have child cut out the hand shapes (littler kids will need help). Arrange the hands upside down (so the pencil marks don’t show), overlapping in a circle, and glue, tape or staple together. Staple straight brown pipe cleaner to back of sunflower. Cut black pipe cleaner in half and bend into circle. Staple to center of flower. Use glue to add sunflower seeds to center.